Cotey Gallagher was born and raised in picturesque Vermont. She knew from an early age that she wanted to be an artist. Cotey attended The Art Institute of Boston (now Lesley University College of Art & Design) and studied many platforms of commercial art, including, caricature, editorial, advertising and book illustration. She received her BFA in illustration in 2000, and has been freelancing since graduation. Recently, Cotey was asked to illustrate a series of four books depicting the beauty and activities of Vermont, the Green Mountain State. Her work on these books inspired her to write her own children’s book, a picture book about grammar and vocabulary. She resides in Salisbury, Vermont with her husband, son and cat. Have You Ever? is a picture book filled with outrageously funny sentences and illustrations. I can guarantee that you have not even thought about the hilariously crazy situations that this book presents. For example, can you honestly say that a toupee-wearing tortoise taunting a tarantula has crossed your mind lately? Well, author and illustrator Cotey L. Gallagher sure has, and her creativity and wonderful imagination are evident. Not only will children and their parents surely enjoy reading these tongue-twisters and laughing at the matching illustrations, but they will also be able to learn more advanced vocabulary throughout the book and with the help of the useful glossary in the back. I absolutely adored this book. I am a grown adult, but I found myself literally laughing out loud at the silly, creative sentences and equally funny, well done illustrations. If I couldn’t help but laugh, I can only imagine how children will react. And one thing I really liked was the activity page in the back that gives kids the opportunity to create their own sentence and picture. This will teach them how to use verbs, adjectives, and nouns in an engaging, fun way. 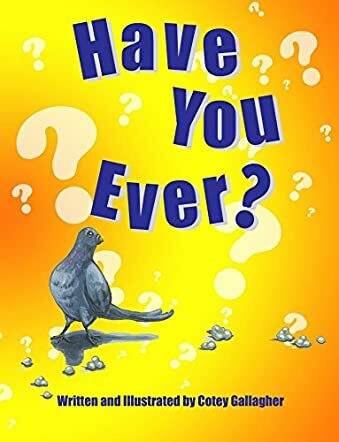 Have You Ever? is a must-have book for elementary classroom libraries as well as children’s personal libraries at home. I will most certainly be reading this one to my daughter as she grows up. Cotey L. Gallagher is definitely a children’s author I will keep my eye on. She has such a unique style, both in writing and in illustrating, that makes her stand out from the rest.